No two loops link through each other, and yet, these loops really don’t want to come apart. How hard is it to separate them? Well, suppose they were made of thin, bendable string, and we could move and (un)tangle them as much as we wanted as long as we kept the strings intact. Could we separate them? Absolutely not! What if we allowed ourselves to cross strands through each other—real string can’t do this, of course. Then we could certainly get the loops apart, but how many such crossings would we need to use? As it turns out, we would need at least 108 strand crossings! This is a good first approximation of how much these loops don’t want to separate. The Pair o’ Boxes sculpture, made from 162 paperclips. I call this Pair o’ Boxes, and it is one of seven new sculptures that I have recently uploaded to my Mathematical Sculpture page. More of these sculptures are shown below, and each has a detailed mathematical description (and larger pictures) at my sculpture page. Go check them out! 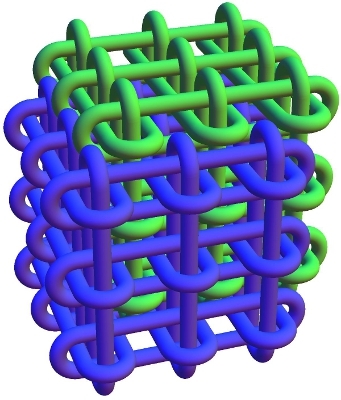 The Pair o’ Boxes page in particular explains much more about the knot theory of the above structure, including a proof that 108 crossings are necessary to fully separate the strands. Sorry for the shameless advertising; we now return to our regularly-scheduled posting.